Note: This article is an opinion piece, the themes discussed here are the author’s interpretations of Radiant Historia. Radiant Historia is a time travel-based RPG on the DS, released in 2011 to universal critical acclaim and positive fan reception. For the select few who have played the game, the story of military agent Stocke and his friends is exceptionally memorable and heartwarming. In addition to keeping the player engaged, the plot delves into fundamental aspects of humanity that most players would not think of in their everyday life. The following article will analyze some of the major themes present in this game. 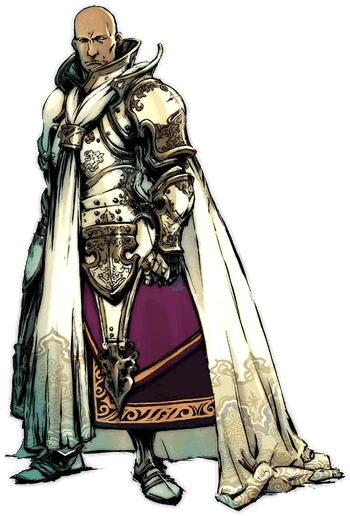 Stocke, the protagonist of Radiant Historia. He is a relatively quiet man, but cares deeply about his friends and his country. 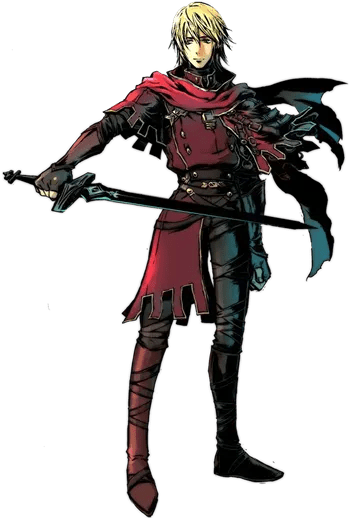 One of the most intriguing aspects of Radiant Historia is the true identity of the protagonist, Stocke. 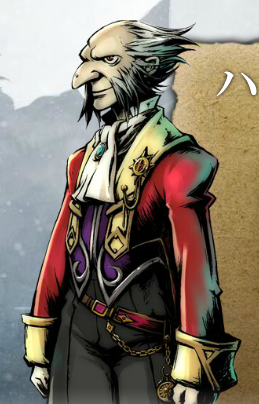 Throughout the game, Princess Eruca alludes to the fact that Stocke looks eerily similar to her late brother Ernst. One of the biggest late game twists is that Ernst was a required sacrifice for a ritual that is needed to restore Flux to the world. Flux is essentially the world’s energy, and a lack of Flux would diminish the world, rendering it a desert of nothingness. Therefore, Ernst made the ultimate sacrifice for the greater good of the continent. Ernst’s body and soul was then taken and resurrected as Stocke, who has modified memories and no recollection of Ernst. The final decision of the game is a fairly simple one: the player must state whether they would like the protagonist to be known as Stocke or Ernst. The majority of players tend to choose Stocke. This choice reflects the fact that humans would prefer to be known as the person they presently are, as opposed to how they were in the past. By choosing Stocke, the player has indicated that they would like the protagonist to be known as who he was throughout the game as opposed to the person that he used to be. This decision signifies that the player strives to be acceptant of themselves as they are in the moment, encompassing of their strengths and shortcomings. This is a characteristic of a self-actualized person, as described by Carl Rodgers and Abraham Maslow. In fact, Stocke as a character is a great example of someone who has achieved self-actualization. Maslow and Rodgers describe a self-actualized person as somebody who has realized their inner potentials. A self-actualized person tends to have a few, close interpersonal relationships. Stocke fits this description perfectly. While he only has a handful of friends, he deeply cares about and has a great relationship with them. For instance, Stocke and his best friend Rosch go to great lengths to help each other, and have mutual respect for one another. Self-actualized individuals are also autonomous and tend to think for themselves. This describes Stocke extremely well, he is independent and can accomplish tasks on his own with a high degree of efficiency. This is displayed by the fact that he was Heiss’ best special intelligence agent. Stocke also tends to form his own opinions as opposed to conforming to the opinions of others, another characteristic of a self-actualized individual. This is illustrated when he is assigned to assassinate Eruca. Instead of blindly assassinating her, he realized through his own personal experience that she is somebody he can trust, and decided to defy orders in an effort to keep her alive. Stocke’s self-actualization is one of the primary reasons for which he is such a likable character. In his theory, Carl Rodgers stated that all individuals have an actualizing tendency, a force that drives us to become self-actualized. Individuals are drawn to self-actualized characteristics, which is the reason for which Stocke is a popular character among fans. General Hugo, the leader of the Alistelian army and a spokesperson for the allegedly ill Prophet Noah. The Prophet Noah is the religious leader in the country of Alistel, where Stocke resides at the beginning of the game. Alistel is at war with a military nation known as Granorg, and the people of Alistel intently pay attention and listen to Noah’s words as a source of hope and inspiration. However, the people of Alistel are told that Noah is bedridden, and the commander of Alistel’s army, General Hugo, acts as a spokesperson for the prophet. Throughout the game, Hugo takes advantage of the influence of the Prophet Noah’s words for his own selfish desires. He manipulates Stocke and his companions to complete missions that benefit him and help him achieve his goals. When Stocke discovers that Hugo has a secret pact with Dias and Selvan, Queen Protea’s advisors, Stocke is deemed a traitor and exiled from Alistel. These were all Hugo’s actions in the name of the Prophet Noah. Eventually, the people of Alistel become impatient and demand an audience from the Prophet himself. In one of the most climactic scenes of the game, Hugo brings a mannequin in front of an impatient crowd waiting for the Prophet. The mannequin falls to the ground and the people of Alistel discover that they have been manipulated. Their actual Prophet has been gone for several years. General Hugo’s manipulative ways represent a recurring theme in the history of mankind. While religion is not inherently bad, it can be used as a tool to manipulate and dominate other individuals. The lack of appearances from the Prophet Noah can be compared to Fidel Castro. In his later years, his public appearances were scarce and there were many rumours regarding him. In addition, while Castro mostly claimed that Cuba is a secular country, he still utilized religious sentiments to gain political power. He claimed on multiple occasions that Jesus Christ was a communist in an attempt to instil his own political beliefs in his country. Another example of the use of religion as a manipulation tool is the 1979 Iranian revolution, in which Khomeini took advantage of religious beliefs to establish the Islamic Republic of Iran. This is just one of many examples of religion being used to gain political power in the history of mankind. General Hugo’s actions exemplify the influence of religious beliefs, which has been misused for personal gain several times in the history of mankind. Heiss, the head of Alistel’s special intelligence unit. Stocke becomes increasingly suspicious of his pure intentions as the game progresses. The game concludes with a confrontation with Heiss, the mysterious man who ran Stocke’s special intelligence agency. His true intentions are revealed, which was to ensure that the Ritual does not occur, thus leading to the desertification of the entire continent. He reveals that he was supposed to be a sacrifice, and that he reached the conclusion that saving the people of the continent was not worth the suffering that the sacrifice endures. However, upon his defeat, Heiss sees the influence that Stocke has had on the lives of his companions. He sees how caring Stocke is and how he helped his friends in unimaginable ways. As a result, he realizes that the world is worth saving and decides that he will be the sacrifice for the current Ritual, in the hopes that future technological advances can restore Flux without the use of a Ritual. During the final boss fight, an emotional song called “An Earnest Desire of Grey” is played. It is an incredible piece that perfectly captures the feeling of the situation. The final dispute between Stocke and Heiss is essentially a moral debate. Heiss’ beliefs are black and white, as he is convinced that the world must end. On the other hand, Stocke understands the situation from a grey perspective. While he acknowledges that the world has many issues, he sees hope for the future and knows that the world is worth saving. This is the reason for their dispute, as Stocke is attempting to change Heiss’ black and white perspective of the Ritual. He has an earnest desire to convince Heiss to see the world in a more nuanced perspective, which is a simple but important idea that every individual should understand. The world should not viewed as merely black and white, truth and lie or good and evil, and Radiant Historia does well in transmitting this message. The first playthrough of Radiant Historia is an incredible experience for the player, as they are captivated by the thrilling plot and can analyze the underlying themes of the game. Stocke is a self-actualized person, which many theorists believe is a common goal of all humans. The realization of one’s potentials is a more realistic and healthier goal than perfection, which many individuals mistakenly strive to achieve. Moreover, Radiant Historia delves into religious topics and demonstrates that while religion is not inherently bad, it can be used as manipulative tool. Finally, the final confrontation of the game is not only a clash between two individuals, but also of two ideologies. Stocke truly believes that there is good in the world, and fights to convince Heiss that the world should not be viewed as black and white. These themes provide an extra layer of enjoyment for the player, and are one of the primary reasons for which Radiant Historia is such a highly regarded game.